"Lynn Diana Johnson, Westbrook College, Class of 1976"
Westbrook College student Lynn Diana Johnson, Class of 1976, was a Nursing major and a Day Hop. 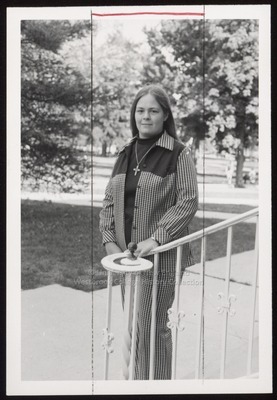 For her senior class candid photo, which appeared in the 1976 Tower Yearbook, she wore a checkered pantsuit with a dark jersey and cross necklace beneath her jacket. Her hair was long, parted in the middle and partially pulled behind her ears. Lynn stands at the foot of Proctor Hall's steps, in the sun with the Campus Green in the background.